This is a range of Elm tree treatments that don't involve the usual inorganic or synthetic chemicals - there are some blurred lines when you start talking about chemicals such as Pyrethrum which are derived from plants. 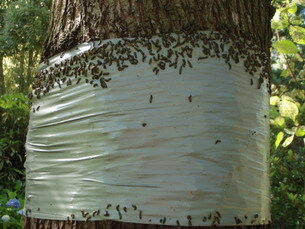 Generally organic Elm tree treatment methods are less effective than synthetic chemical methods, however they can reduce beetle numbers to an acceptible level. All these methods involve breaking the Elm Beetle life cycle as the larvae descend the trunk to pupate, there are a number of options both chemical and other. Chemical banding is usually done with specific Carbaryl products (read the label CAREFULLY this chemical is dangerous) it needs to be high on the trunk away from children and pets. If you can't find the specific products some people will soak hessian or similar in chemical and tie this around the trunk. Non chemical banding or wrapping can simply be wide sticky tape; sticky side out,. Whichever method is used the timing is very important. The aim is to catch the Elm beetle larvae as they climb down the trunk so if your treating trees yourself try and do the banding before they head down which will be after they have hatched and crawled around for a while eating and growing, the exact timing will depend on the weather, you will need to monitor your tree closely to pick the best timing. Use of natural predators of Elm Leaf Beetle; research by the applicable government agency into these options is ongoing. We will be trialing the use of a pet duck near the base of a tree, they love small insects and may prove better than a tape or banding due to the proactive approach we expect Daffy to take. Prior to the introduction of the duck we will not be treating the tree for at least 4 years to minimise the chance of the duck being exposed to residual chemicals. We have access to hundreds of Elm Trees around Victoria where we can run trials and are keen to hear about any control methods or concepts that may help control the beetle. Particulalry where chemical use can be minimised or eliminated. Non chemical trunk banding with heavy duty tape inside out. The Elm Leaf Beetle larvae are trapped as they head down the tree. Timing of treatment is crucial, larvae will start going to ground in Melbourne around December.